The crew's first collective album as a whole and they bring everything to the party including the party itself! If you haven't heard this yet and are a fan of the Living Legends, then this is what you should pick up before anything else. Get a feel for each individual member as they are all extremely diverse in what they bring to the table and spit so sickly, keeping the listeners over the years addicted to their super nice style. Featuring a previously unreleased bonus track. 1, 3, 5, 7, 8, 11, 12 produced by Eligh. 2, 4, 6, 10, 13, 14, 15, 16 produced by The Grouch. 9 produced by Sunspot. Cuts: 2, 13 by Bizarro. 4, 11, 14 by DJ Drez. 17 (re-issue only bonus track) mastered by Deeskee. The Living Legends in my opinion, are the best hip-hop collective I've heard in several years, and are one of my personal favorites. Coming out of the Bay area, the crew was formed in 1994 by Sunspot Jonz (aka BFAP) & Luckyiam.PSC (aka PSC), otherwise known as the Mystik Journeymen. In 1995 they met The Grouch, which is when the rest of the collective took shape. The other members include Murs, Eligh, Aesop (aka Asop), Bicasso (aka Bizarro), Scarub & the Japanese Living Legend (who raps in his native tongue) Arata, who only appears once. So that's 9 members, and 8 full-time members (are you seeing my Wu-Tang comparison?). These guys are independent/underground. The difference is that the Living Legends have become successful through self-distribution (famous for slanging handmade tapes back in the 90s) and self-promotion. They have truly made a name for themselves based on skills, and the quality of their music. 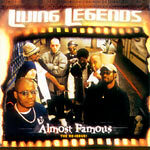 "Almost Famous" is the cornerstone of any Living Legends collection. It really is the very best introduction to this collective as a whole. I like so many tracks on this album, I can't begin to pick favorites. I suggest adding this to your collection. You won't be sorry. Below is a list of each track, the producer that goes with each, and the rappers that appear on each track in order of the timeline. Sometimes listening to a huge collective like this can get confusing if you're trying to figure out who's rapping. Hopefully this will help.